I believe the hounds came first, not of course looking like contemporary breeds of hound in conformation, but first in functional use for man. Buffon, I know, for one, argued that the sheepdogs came before them but I can find no logic in that. For to use sheepdogs primitive man had first to become a farmer of sorts yet man was a hunter-gatherer long long before he became a farmer. Although I acknowledge that in some places sheep were domesticated before dog. The sheepdog's instinct for rounding up numbers of sheep or singling one out for attention almost certainly developed from the hunting style of primitive wild dog and is still practised in the wild today. But before man kept animals of his own, he needed to fill his pot with the meat of wild animals and what better ally than a tamed wild dog acting as a hound. Such a canine ally could assist man to locate game in the first place, be used to drive the game towards precipices, pits or human hunters with their primitive weapons such as spears. Subsequently these domesticated dogs were to be trained to drive selected game into specially-constructed enclosures or into cleverly-positioned nets. In due course very fast game was hunted using very fast dogs, big game was hunted with big dogs or hunting mastiffs and feathered game hunted using dogs which could either silently (like a setter) or noisily (like a bark-pointer) indicate the location of the quarry. In time the tracking dogs became specialist hounds, able to hunt boar or hare, wild asses or deer, bison or elk. In Europe, the names of the early breeds in the hunting field indicate their function: bufalbeisser (buffalo-biter), barenbeisser (bear-biter) and bullenbeisser (wild bull-biter). 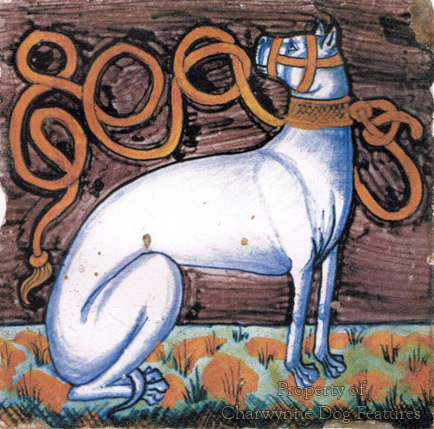 Much is made by breed-historians of the hounds of Egypt, Greece and Rome but there is ample evidence of houndlike dogs long before these times. In the mesolithic period, 9000 years ago, one or two species of larger animal provided the main source of meat in the human diet. In Europe these were red deer and wild boar, in north America the bison and in western Asia the gazelle and wild goat. One survey (Jarman 1972) carried out in 165 sites of late palaeolithic and mesolithic age throughout Europe revealed the meat-sources of the hunter-gatherers. 95% of the sites indicated the presence of red deer, 60% showed roe deer, 10% revealed elk and chamois and a few had bison and reindeer. 20% of the sites indicated the presence of dog. One of the earliest records of dog remains comes from the palaeolithic cave of Palegawra in what is now Iraq, some 12,000 years old. Canid remains found at Vlasac in Rumania date from c.5400-4600BC and the other remains there indicate no other domesticated animals. There were huge hefty hunting dogs throughout western Asia from well before 2000BC and a variety of hunting dogs in ancient Egypt, their white antelope dog resembling our modern harriers in conformation. The Celts, the Greeks and the Romans greatly prized their hunting dogs and left descriptions of them. 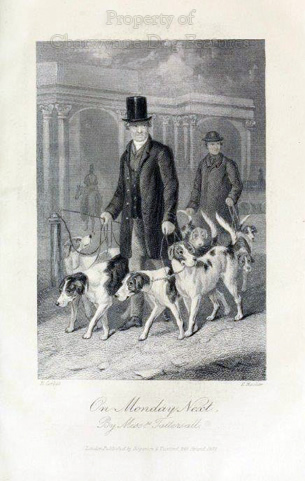 Hounds were extremely valuable as pot-fillers and were therefore extensively traded. But well before 2000BC, the Sage Kings of the Yellow River valley in China, the Dravidians of the Indus valley in India and the Sumerians in the valleys of the Tigris and the Euphrates were, especially by European standards of that time, sophisticated hunters. Discoveries from near Ergani in Turkey dated from 9500 BC and from east Idaho in the United States dated from 9500BC to 9000BC prove the existence of tracking dogs in cave settlements. Ivory carvings from Thebes, dating from 4400 to 4000BC, depict fast running hounds. 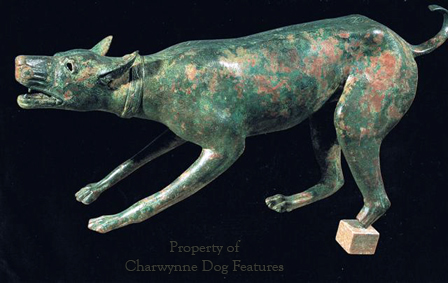 The Phoenicians had hounds hunting both by speed and by stamina using scent. 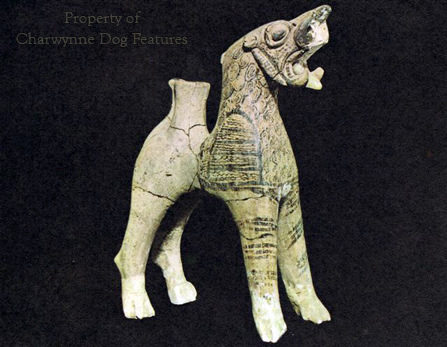 In Babylon powerful short-faced hounds were used to hunt wild asses and lions. The Assyrian kings, assisted by their keepers of hounds, hunted lions, wild bull and elephant. 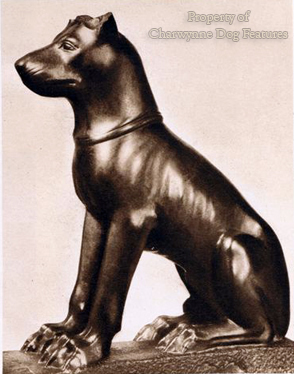 From 2500BC onwards hunting with hounds was a favourite entertainment for noblemen in the Nile delta. One scribe of the 19th dynasty described a pack of hounds, 200 of one type, 400 of another, stating that "The red-tailed dog goes at night into the stalls of the hills. He is better than the long-faced dog, and he makes no delay in hunting..." In the Rig-Veda, an ancient Sanscrit record of Hindoo mythology, we can find hound-like dogs described as "broad of nostril and insatiable..." In time the specialist hounds developed physically to suit their function, the "long-faced" dogs needing a slashing capability in their jaws backed by excellent longsighted vision. The "broad-nostrilled" wider-skulled looser-lipped dogs needed plenty of room for scenting capacity in both nose and lips where scent was tasted. As hounds became linked with human preferences in method of hunting and choice of quarry, so the breeds developed. It is possible to find in Greek and Latin literature some sixty-five breed-types by name although some are merely synonyms. The Greeks had hound breeders who insisted on the importance of pure bloodlines. But not all their hounds were Greek in origin for the Greeks were a maritime people, with knowledge of the whole of the Mediterranean and the Black Sea. Pollux and Oppian refered to a breed coming from the Spanish peninsula as the Iberian; in Italy there was the Ausonian, discovered by Greeks settling in Naples, the Salentine, the Tuscan (a hunting dog which indicated concealed game not a ground scent seeking hound) and the Umbrian, able to run down game but not kill it. Flavius Arrianus, in the second century A.D., described two Celtic breeds, the Segusiae (named after a tribe from a province which included what is now Lyons) with excellent noses, good cry but a tendency to dwell on the scent and the Vertragi (literally "lots of foot"), rough-haired greyhound-like dogs. Claims have been made for the Segusiae being the prototype of our modern scenthounds: bloodhounds, foxhounds, bassets and harriers. But Arrian found nothing remarkable or noteworthy about them, merely explaining that they hunted in the same way as Cretan and Carian hounds. Xenophon records seeing gazehounds in Asia Minor. I suspect that the Greeks and Romans found the Celtic greyhound not a new breed but a variety of one of the oldest types in existence. In time the Greeks became aware of the hounds from the Rhineland called Sycambrians, the Pannonian hounds from what is now northern Yugoslavia and the Sarmatian hounds from southern Russia. From the north of the Himalayas came a ferocious breed of hounds known as Seres after the people of that name. From further south came the red-brindle "Indian" hounds, recommended by Xenophon for hunting deer and wild boar. From Persia in early B.C. came the Elymaean hounds (more precisely from the Gulf area), the fierce Carmanians, the savage mastiff-like Hyrcaneans (from the area where Tehran now is and probably more like today's broad-mouthed breeds than any Molossian) and the fighting hounds, the Medians. In Asia Minor were the Carians (from the area where the hound-like Anatolian shepherd dogs of today come from), esteemed by Arrian as tracking hounds, with good nose, pace and cry. The much bigger variety of the Carian, the Magnesian, was a shield-bearer in war. And from the south of this region came the Lycaonian hounds, highly regarded for their admirable temperament. In north Africa, Aristotle tells us that the Egyptians favoured the smaller sighthound type, comparable with the so-called Pharoah hound and whippet of today. The Libyans had good hounds and the Cyrenean hounds were allegedly crossed with wolves, with lurcher-like all-purpose hunting dogs known to exist in central and southern Africa. In ancient Greece, Epirus in the extreme north-west, produced the Acarnanians, which unusually for those times ran mute, the Athamanians, the Chaonians (from which came the legendary Laelaps) and the longer-eared Molossian hound. 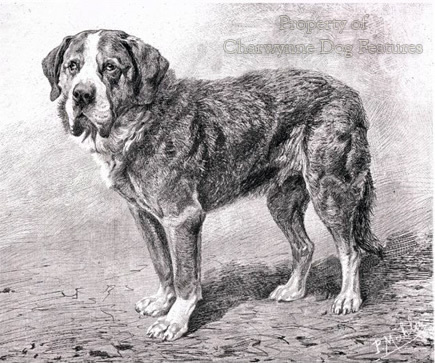 Since the cynologist Otto Keller produced his personal theory which linked the latter with the big mountain dogs of Tibet and then with the Tibetan wolf, mastiff and Great Dane researchers have had a field day. The Molossians of ancient Greece were in fact usually sheepdogs, sometimes shaggy-coated and often white. Xenophon refered to the Locrians as the powerful short-faced boar-hunting hounds. For me, the most important Greek hound was the Laconian, sometimes called the Spartan hound. This hound was good enough to be held in high esteem for many centuries, hence the Shakespearean reference--although the description there is not accurate. We have on record a great deal of information on the Laconian hound, a harrier-sized scenthound with small prick ears, free from throatiness or dewlap. It was more tucked-up than our scenthounds of today but not as much as the modern sighthounds; the contemporary Italian breed, the Segugio, ears apart, being the nearest modern equivalent. Tan and white or black and tan, bold and confident, built like a steeple-chaser, their fame spread wide and their blood was extensively utilised. Xenophon's chief delight was hunting hare with them. It's strictly a hound's game. You are but one in name."